Mail is one of the hardest services to manage. Actually, mail is pretty simple in and of itself: there’s protocols people use to access their mail (such as IMAP and POP), protocols used to communicate between mail servers and send mail (SMTP, SMTPS) and then there’s a database of mail and user information. In macOS Server 5.4 for High Sierra, all of these are represented by a single ON button, so it really couldn’t be easier, once you can just enter email addresses into the Users section. Once all of that is taken care of (I’ll add more as I think about it) then it’s time to enable the mail service in the Server app running on Yosemite. Actually, first let’s setup our SSL certificates. 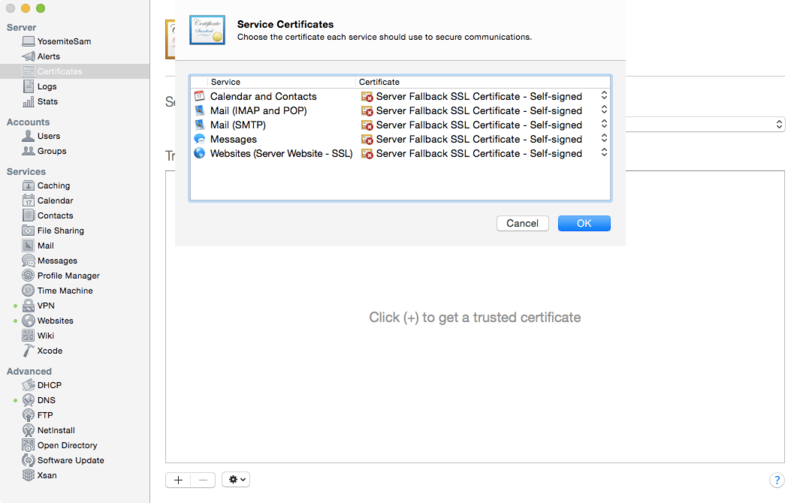 To do so, open the Server app and click on Certificates in the SERVER section of the sidebar. 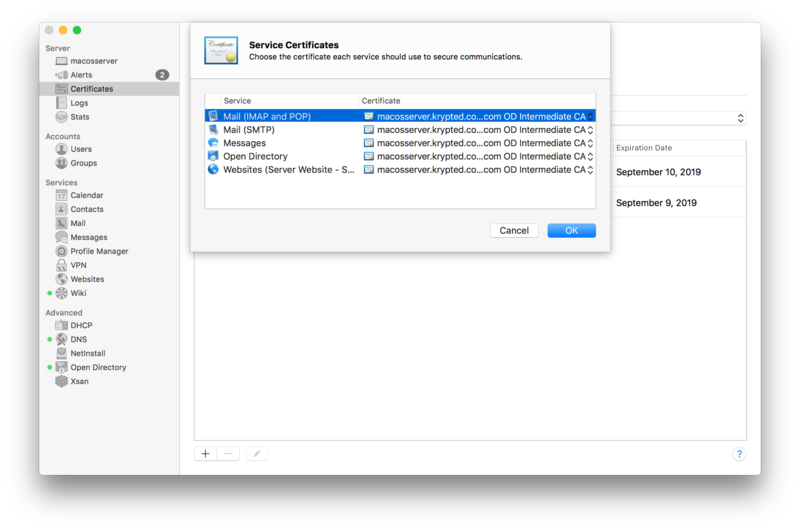 Here, use the “Secure services using” drop-down list and click on Custom… for each protocol to select the appropriate certificate to be used for the service. Click OK when they’re all configure. Now let’s enable the mail service (or outsource mail). To do so, open the Server app and click on Mail in the SERVICES list in the sidebar. Status: Indicates if the server is running. Edit Permissions: Limits the IP addresses capable of connecting to the server. 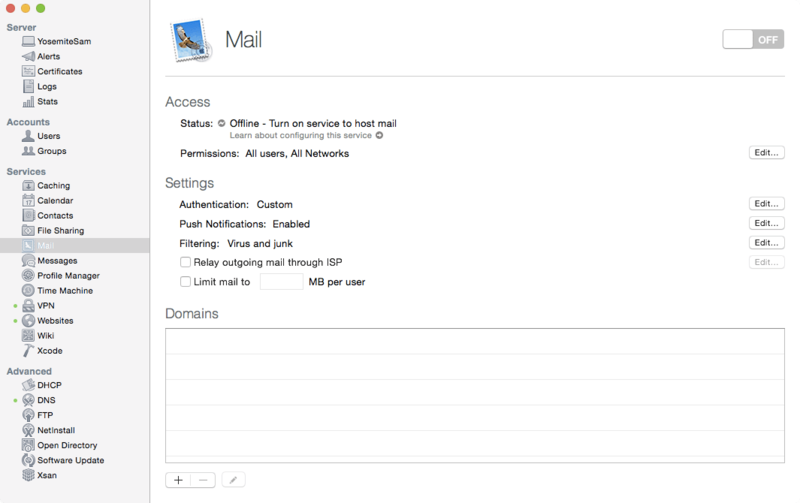 Domains: Configures all of the domains the mail server will listen for mail for. Each account on the server has a short name and each domain name will be available for each short name. 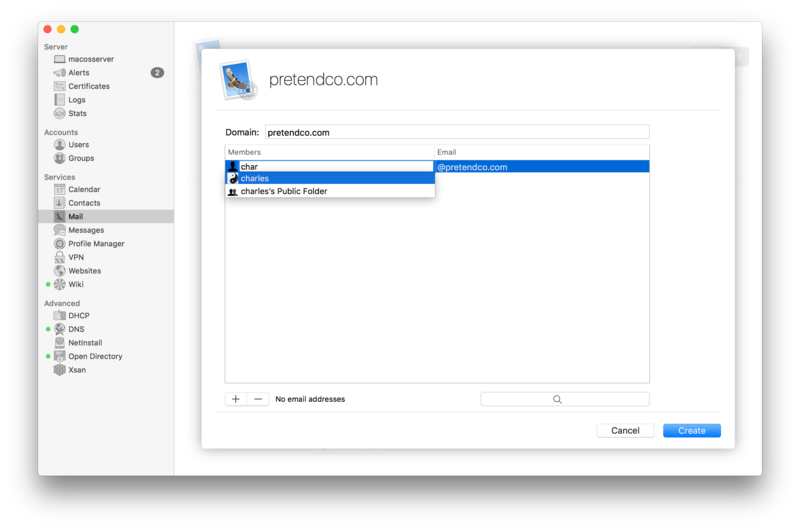 For example, an account with a shortname of charles will be available for email addresses of charles@pretendco.com and charles@krypted.com per the Domain Name listing below. 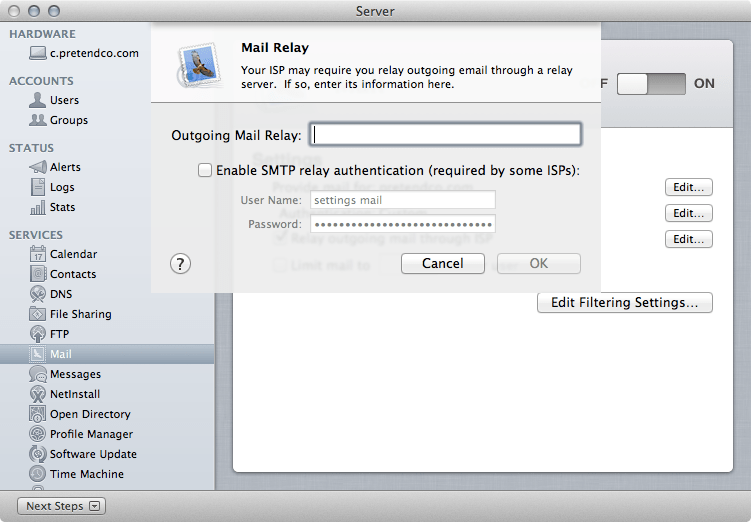 Mail Relay: Provide a server that all mail will get routed through from the server. For example, this might be an account with your Internet Services Provider (ISP), an account on an appliance that you own (such as a Barracuda) or with an external filtering service (such as MXLogic). Mailbox size: Configure the total amount of mail a user can have in the mail store, in Megabytes. 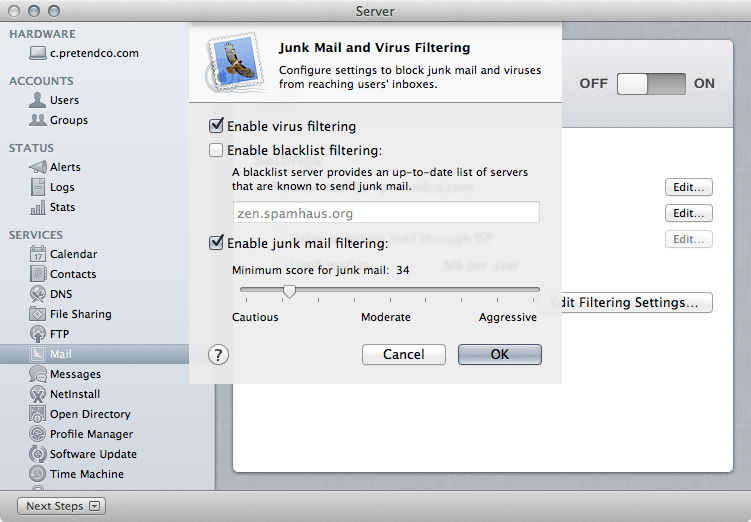 Filtering: Configure antivirus, spam assassin and junk mail filters. The “Enable virus filtering” checkbox enables clam. The “Enable blacklist filtering” checks the RBL (or RBLs) of your choice to check whether a given server is a “known” spammer and the “Enable junk mail filtering” option enables spam assassin on the host, configuring it to block based on a score as selected using the slider. sudo serveradmin settings mail:postfix:spam_subject_tag = "***DIEEVILSPAMMERSDIE*** "
sudo serveradmin settings mail:postfix:virus_quarantine = "diespammersdie@krypted.com"
Apple Mail. It’s hard to get by on a Mac or iOS device without it. But living with Mail can be a recipe for hair-pulling frustration, whether because of connection failures caused by Mail’s mysteriously unreliable automatic settings detection or trying to figure out the difference between long and short swipes in the iOS version. 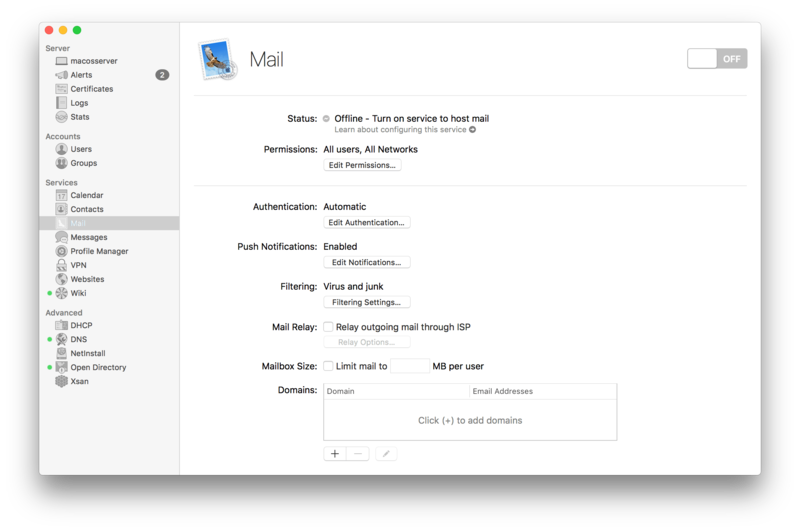 No one knows more about Mail than Joe Kissell, and he has distilled his most important advice into the second edition of “Take Control of Apple Mail,” now completely revised and updated to explain Mail in 10.10 Yosemite and iOS 8. 183 pages of goodness is only $15. Point others here > http://tid.bl.it/tco-apple-mail Apple’s Pages word processor built a loyal following because it wasn’t Microsoft Word, but Apple threw us a curveball with the release of Pages 5 for the Mac and Pages 2 for iOS, removing numerous features and shuffling the interface around. Michael Cohen has spent the last year spelunking through the depths of Pages on the Mac, in iOS, and in iCloud to ferret out what has changed, how to accomplish both everyday and complex word processing and layout tasks, and the best ways to work back and forth in all three versions of Pages via iCloud Drive in Yosemite and iOS 8. At 266 pages, “Take Control of Pages” comprehensively documents what you want to do in Pages for $20. Point others here > http://tid.bl.it/tco-pages-info Thank you for your support of the Take Control series, and may all your wishes comes true this holiday season! 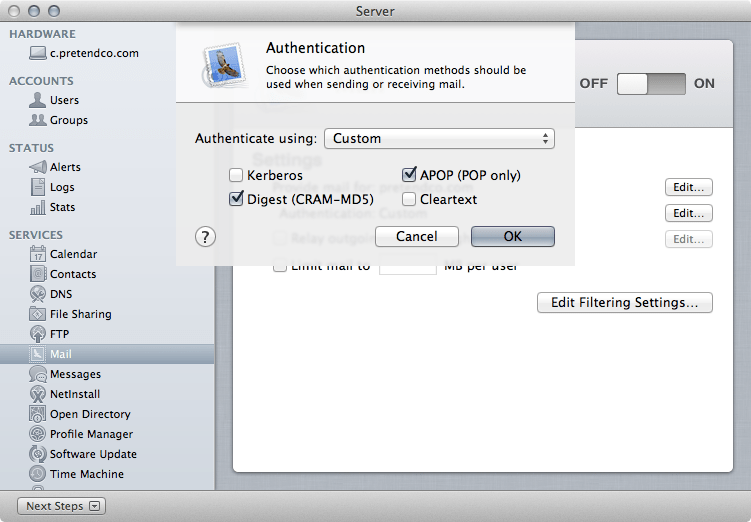 Once you’ve configured the settings for the Mail service, click on the ON slider to enable the service. At this point, you should be able to telnet into port 25 of the host to verify that SMTP is listening, preferably from another mail server: telnet mail.krypted.com 25 You can also check that the mail services are running using the serveradmin command along with the fullstatus option for the mail service: sudo serveradmin fullstatus mail Which returns with some pretty verbose information about the service, including state, connections, running protocols and the rest of the following: mail:startedTime = ""
mail:logPaths:Server Error Log = "/Library/Logs/Mail/mail-err.log"
mail:logPaths:List Server Log = "/Library/Logs/Mail/listserver.log"
mail:logPaths:Virus DB Log = "/Library/Logs/Mail/freshclam.log"
Contacts – Nope, it’s not called Address Book server, it’s the Contacts service. Same with the client side application. DNS – DNS management is moved into the Server application. You can also now restrict who you do lookups for in the GUI. Under the hood very little changes. File Sharing – Nothing really changes with file sharing, except the wiki integration described in the Wiki section in a little bit. Firewall – The firewall option is gone, as is the ipfilter at the command line, but pf is easy to configure from the command line. 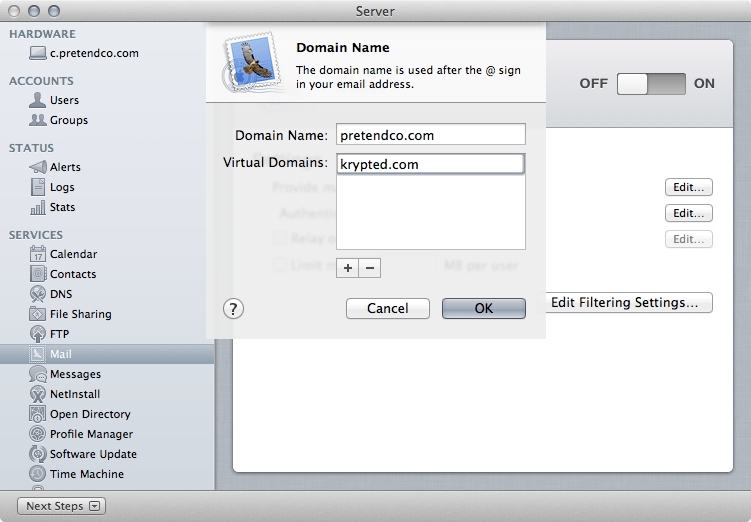 FTP – It’s a quick and easy single share solution from the GUI. Using the sharing command there’s still tons available to administrators. 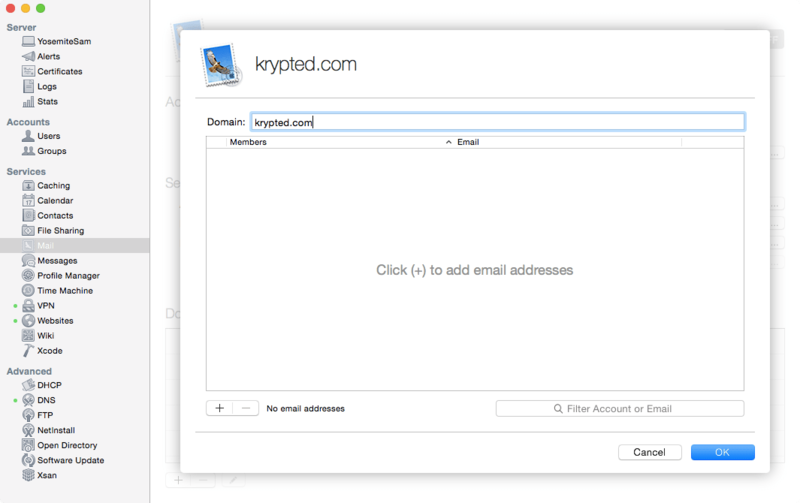 Mail – Authentication mechanisms and domains are in the GUI, but very little changes otherwise. Messages – The service name has changed from iChat to Messages in the GUI but is still jabber from the command line. The big change with this service is that the client side is now able to leverage iCloud to instant message mobile devices as well. Therefore, the text messaging component is client-side and has no impact on the jabber service itself. NetInstall – The “NetInstall” service is NetBoot. It can host NetRestore or NetInstall images, but the heavy lifting for that stuff is done in System Image Utility. And the output of the SIU commands are now more scriptable through the automator command line interface. The NetInstall screen is now in Server app and is a good port from Server Admin in that it’s similar in look and feel to the NetBoot screen in Server Admin. A feature that isn’t in the GUI is diskless NetBoot, which is fine because I documented how to do it when I realized it would be an issue for a few customers. Open Directory – Given that Server Admin is gone, something had to happen with Open Directory. The Open Directory screens have been moved to Server app where it’s fast to setup and tear down Open Directory. Open Directory based Users and Groups are also created through the Server App, although Workgroup Manager can be downloaded and used still. 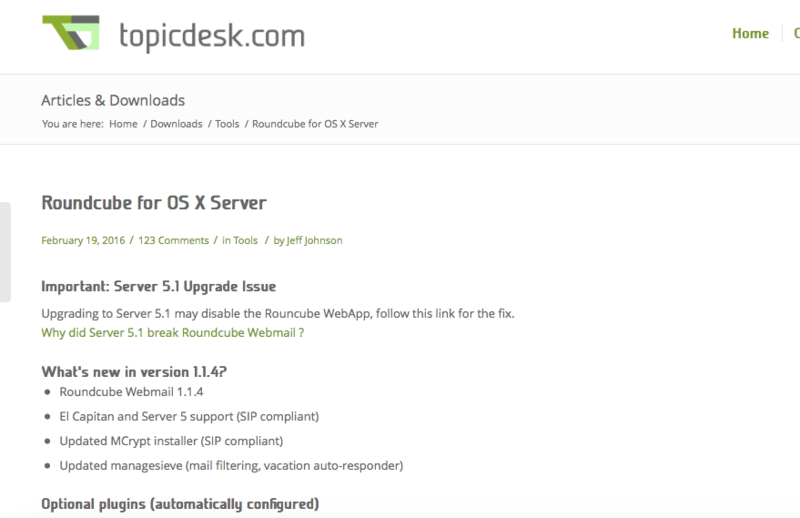 Immediately following upgrades, the add and remove users buttons are gone for previously stand-alone hosts. Also the Manage Network Accounts option is now gone from Server app, replaced with the traditional ON button supplied by Apple for other services. Profile Manager – This deserves its own post, which is in the queue, but suffice it to say that while you can’t tell when looking in Server app, there are a number of upgrades to Profile Manager. Software Update – Management of the service is moved from Server Admin to Server app. There are now fewer options in the GUI, but the same in the command line. Cascading is a little different. Time Machine – Time Machine server is the same… The versions option from the Time Machine Server preference pane is gone and the layout is a little changed, but the server component is identical in functionality as well as look and feel. VPN – Unless you add another supported VPN protocol there’s not much to do after fixing most issues in 10.7.4. Except fixing the last issue with search bases, seemingly resolved as it’s working for me pretty well. Websites – There are more options in the GUI for new sites. 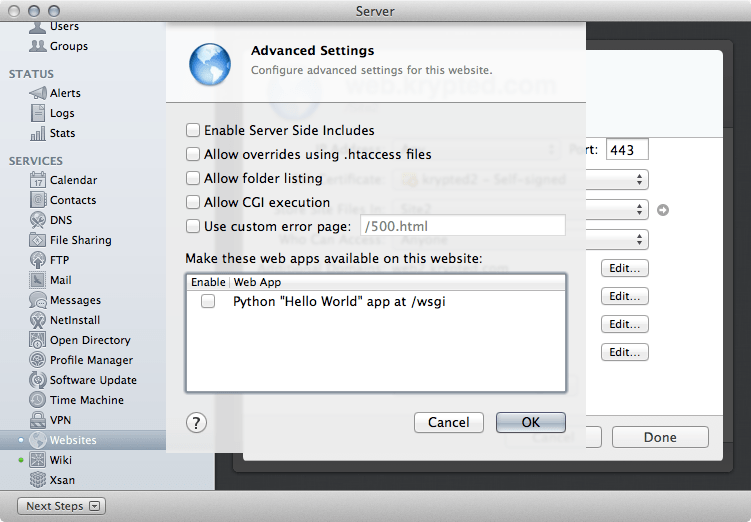 The default site appears twice (once for 80 and once for 443), but there are more options, such as the Web App functionality that comes with a default Python “Hello World” app. Also the server is still called web from the serveradmin command line, but is now called Websites through the GUI. Wiki – The wiki has themes again, although they’re just color schemes. And you can create your own custom banners and upload, which brings back two of the most common feature requests from people that hack the look and feel of the wiki in versions previous to Lion. But the most substantial aspect of the Wiki to change to me is the document management options, available to users in WebDAV or through the portal. This allows for a very mobile-friendly file management tool. Blogs and wikis for the most part stay the same and have a very clean upgrade process from Lion. The command line tools also feature some new options for indexing, etc., which many will find helpful. Xsan – cvadmin, cvlabel, cvversions, etc are now stored in /System/Library/Filesystems/acfs.fs/Contents/bin/ and Xsan has its own entry in the Server app. Despite hearing people question its future, I’ve never seen as many questions flying around about how to do things with Xsan than I do now. Storage sales are up, monkey chatter on the web is up, deployments are being booked and Xsan looks here to stay. The Server app only really shows you a status of things, but the Xsan Admin app is now embedded in the Server app and available through the Server app Tools directory. 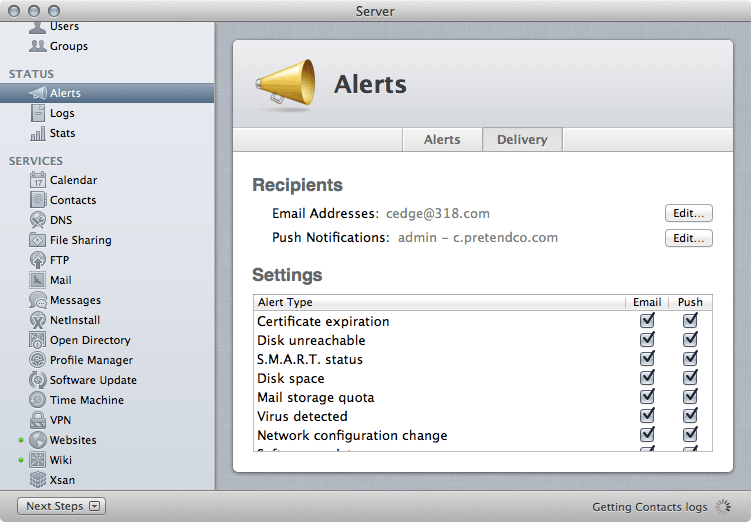 The Alerts options are much more robust in Mountain Lion than they were previously. You can now get alerts on a myriad of things, incuding certs, disks, space, storage quotas, virus detection, network changes and software updates. One of my little irritations about OS X just got easier. When I’m using Mail and I copy and email address and paste it somewhere, it has the name of the contact bracing the email address wrapped with a <>. This is a royal pain. I am pretty sure that every single flippin’ time I’ve removed the cruft around the email address. While digging around in com.apple.mail I noticed a key for AddressesIncludeNameOnPasteboard that was set to True. Holy crap. Change to False and this minor irritation is gone. Viola, OS X is now even better: defaults write com.apple.mail AddressesIncludeNameOnPasteboard -bool FALSE To set it back: defaults write com.apple.mail AddressesIncludeNameOnPasteboard -bool TRUE I’m sure others have uncovered this before me (mostly because I googled it after I found it). So nothing really new here, but pretty sure that one will save me at least 3 minutes per year. Yay for me. 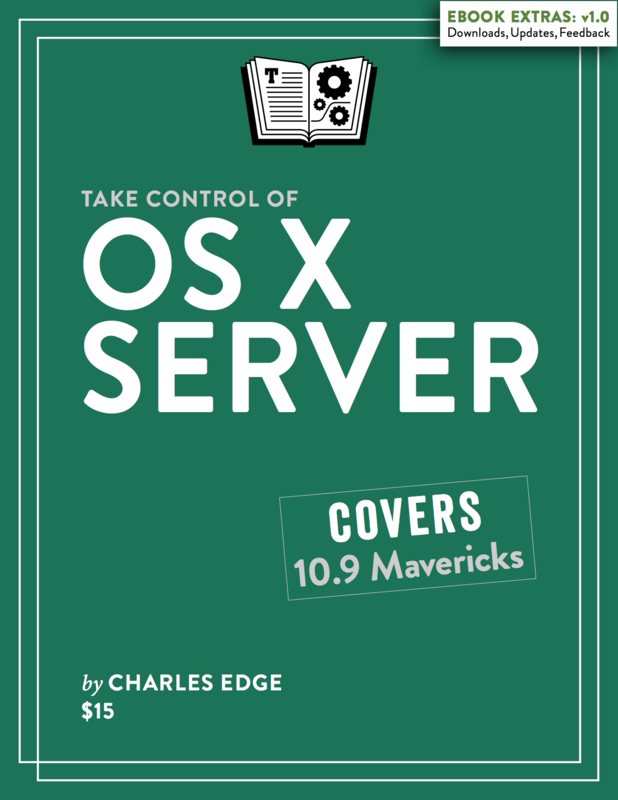 I frequently write about adding entries in OS X Servers configuration database using serveradmin. But there are a lot of causes for various symptoms in OS X and trying some post of mine might end up biting you later, if it doesn’t fix your problem and you end up leaving the keys in place in OS X Server. 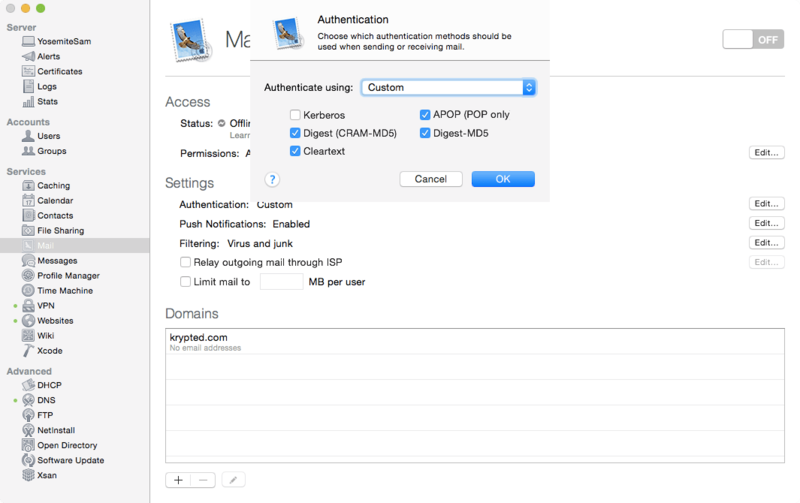 Therefore, let’s look at something I might tell you to do, such as set a mail relay host from serveradmin: serveradmin settings mail:postfix:smtp_auth_relay_dict:smtp_auth_relay_host = mdm.krypted.com Once the setting has been configured, you might want to get rid of it outright. Now, this one happens to be exposed in the GUI, so you could set it there. But that’s not really any fun. According to the man page, you should be able to delete the keys and array entries using delete as the payload. But this is one place where the man page is actually incorrect. Let’s test by using delete as the entry, as follows: serveradmin settings mail:postfix:smtp_auth_relay_dict:smtp_auth_relay_host = delete Run serveradmin settings for mail to list all the settings: serveradmin settings mail And you’ll note that the key is actually just like you typed in, where rather than expand to function as a “delete the key” command, delete becomes the actual payload as a string: serveradmin settings mail:postfix:smtp_auth_relay_dict:smtp_auth_relay_host = "delete" Many services have a corresponding property list that contains their settings. These are stored in /Library/Server in a Config directory nested inside the service name. 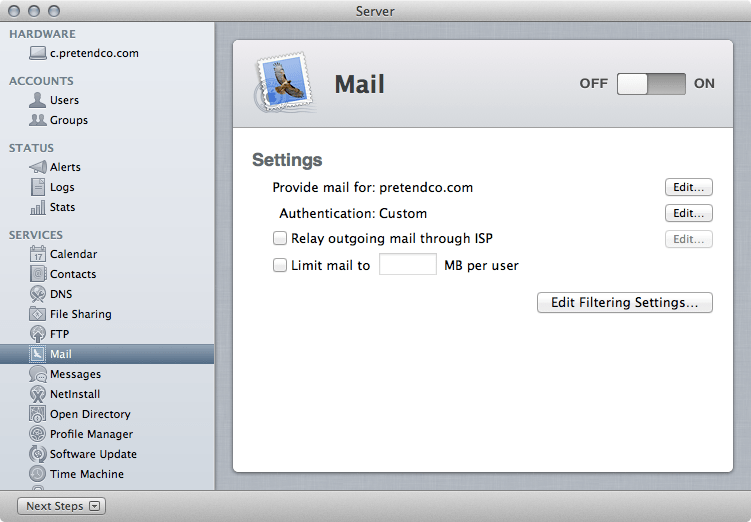 So for example, settings for the mail service would be stored in /Library/Server/Mail/Config/MailServicesOther.plist. 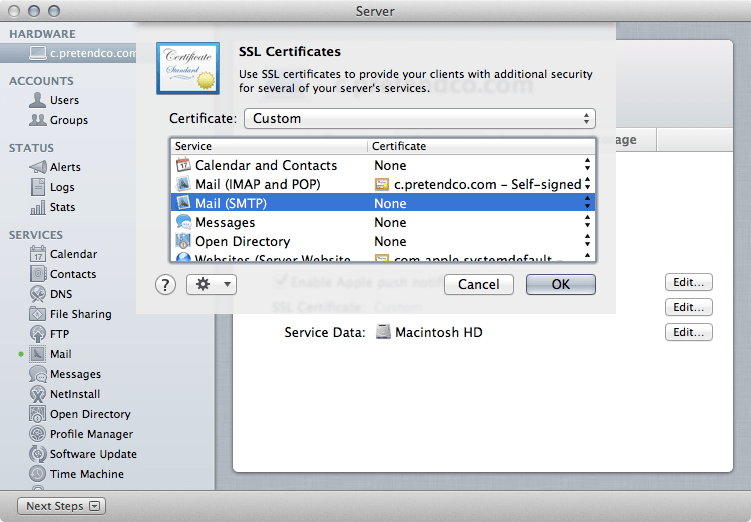 In the same folder is MailServicesOther.10.8.plist, which references the settings files for a few other services that help to make up the Mail service. Delete the array entry and you’ll have achieved your goal of removing the entry. Some of the service configuration files are .config files instead of property lists. In those cases, look for the keys in the configuration file and restart after you change them, but make sure to check that the changes took as many times you might have something else you need to do. I frequently use fsevents to see which configuration file I’m editing when I run a command in serveradmin and then find the correct value in the plist that I’ve altered once I’ve changed something in serveradmin. Overall, the man page illustrates the most desirable way to delete custom entries. However, in the absence of this working, it’s worth noting other ways to achieve the same result.